This should not be difficult – there is no place with our courts for CRIMINALLY INDICTED JUDGES. Do we not have a reasonable vetting process to make sure fiascos like the Judge Vettori-Caraballo occur. In re Disqualification of Vettori-Caraballo. Sua sponte, Diane Vettori-Caraballo, Attorney Registration No. 0062545, disqualified from acting as a judge pursuant to Gov.Jud.R. III(6)(A). Further ordered that she shall remain disqualified while any and all indictments filed in the United States District Court for the Northern District of Ohio, Eastern Division, are pending and until further order of this court. WKBN 27 reports on a possible resignation. Three judges plan to step in to fill the vacancy left in Mahoning County Court No. 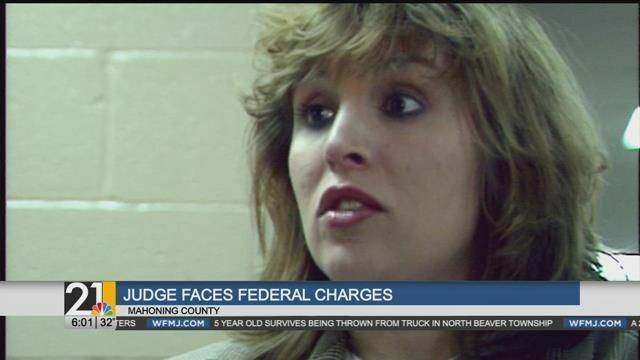 3 now that Judge Diane Vettori-Caraballo faces criminal charges. Judge Joseph Houser, Judge Scott Hunter and Judge David D’Apolito will share the responsibilities, and there will be no change to the court’s services, according to a statement from Mahoning County Area Courts. The statement indicates that Vettori-Caraballo left a voicemail to Administrative and Presiding Judge Scott Hunter, anticipating her resignation as judge of the Mahoning County Area Courts. The Supreme Court of Ohio disqualified her from serving as judge during her pending criminal trial. She’s accused of stealing at least $96,200 from a deceased former client’s home. She had been helping the client, Dolores Falgiani, draft a will when she learned about the money stored in shoe boxes around Falgiani’s home, according to court records. Vettori-Caraballo is charged with one count of fraud, one count of structuring cash deposits and one count of making false statements to law enforcement. As those area court judges scramble to fill the void left by Diane Vettori’s disqualification, the head of Mahoning County’s Democratic Party urges residents to have faith in the local legal system. Chairman Dave Betras, who is also an attorney, said Vettori-Caraballo and her alleged actions are very uncommon. “In any system, there is going to be one or two that, you know, something might happen. But overall, the judiciary in Mahoning County is excellent,” Betras said. Charges against Vettori-Caraballo came just a day after a complaint was filed against Mahoning County Probate Judge Robert Rusu for failing to recuse himself from dozens of cases involving former clients from his private practice days. Betras said there is no comparison between the two cases. “Judge Rusu’s case cannot and should not be compared in any fashion to Judge Diane Vettori’s case – not even close,” Betras said. While Rusu’s case is being handled by the Ohio Supreme Court and is not a criminal matter, Vettori-Caraballo is due in federal court next week and is expected to plead guilty to her charges.